The simplest preparation of pan-fried sole is the best because it highlights the sole’s delicate texture and flavor and does not overpower them. I love this simple, delicious recipe for a pan-fried sole that uses just a little butter to enhance the sole’s naturally delicate flavor. Sole is a mild fish with a delicate texture and flavor, so this simple preparation is ideal for it. You don’t want to overwhelm sole with lots of spices and ingredients. How long do you pan fry sole? The most important thing when frying sole fish is not to overcook it, or it will turn out very dry. I find that 3 minutes per side over medium to medium-high heat is perfect. I believe it is. While sole fish is not as high in omega-3 fatty acids like salmon, it is still a healthy choice, especially wild caught Pacific sole. Butter, for most healthy people, is harmless. The only problem ingredient here is the flour, but you can use almond flour instead. Just make sure you use blanched almond flour and not coarse almond meal. 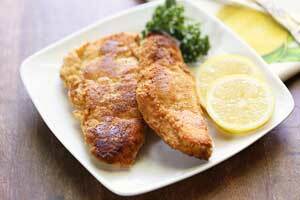 Rather than pouring warm butter-lemon sauce over the fish, as traditional recipes suggest, I prefer to serve the fish with lemon wedges on the side. This allows diners to squirt a little lemon juice on top of their fish right before they eat it. I find that serving it this way ensures crispy, non-soggy fish. As for sides, I often serve pan-fried sole with a side of roasted asparagus. It’s also excellent with roasted brussels sprouts. I don’t usually have leftovers when making pan-fried sole. When I do, I find that they keep okay in the fridge, in a sealed container, for up to 3 days. But they are not as good as when fresh. Reheat the leftovers very gently, covered, in the microwave on 50% power. 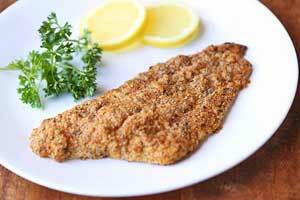 The simplest preparation of pan fried sole is the best, because it highlights the sole's delicate texture and flavor. Season the sole fillets with salt and pepper, then dust with flour on both sides, shaking the excess off. In two large nonstick skillets, or in a double-burner nonstick griddle, melt the butter over medium-high heat. When foaming subsides, add the fish. Cook the fish, turning once with two wide spatulas, until golden-brown, about 3 minutes on each side. You might need to lower the heat to medium after turning, depending on how hot your pan gets. Transfer the fish to plates. Garnish with parsley and lemon wedges. Serve immediately. Nutrition info if using almond flour: calories 284, fat 15g, saturated fat 4g, sodium 432mg, carbs 3g, fiber 1g, sugars 0g, protein 34g.